One of the most infuriating things that can happen while traveling is to find out your flight has been delayed after you've boarded, leaving you stranded on the tarmac and stuck in a cramped seat. Sometimes, that sort of thing just can't be avoided, though, like when a rogue flamingo came out of nowhere and started strutting on the runway like a diva, blocking planes from moving at a busy airport. After touching down on the island of Mallorca on April 7, a full easyJet plane was taxiing to its arrival gate when the ground staff contacted the pilot to say that a flamingo was just yards away from the aircraft and that it should delay its movement, according to The Irish Sun. The bird seemed totally unfazed by the chaos it was causing, as passengers looking out the windows of nearby planes whipped out their phones to capture the creature gallivanting across the busy tarmac. The plane paused, before slowly taxiing far enough behind the bird so as not to disturb it. Then, at one point the flamingo apparently started to fly off, but quickly changed its mind and continued its long, graceful walk, keeping pace with the aircraft. The plane was able to make it to the gate eventually, but not after treating curious passengers to a delightfully unique welcome to the island. Flamingos are frequent visitors to the area, so it's not all that surprising that one showed up at the airport. 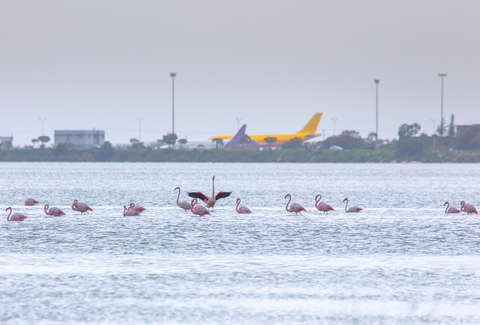 However, even the air traffic controllers were taken aback, and tweeted about the incident from the official Spanish Air Traffic Control handle, writing "A flamingo received passengers arriving at Palma airport this morning. Very elegant, walking on the tarmac..."
Should we all be so lucky to be delayed by a showy exotic bird someday.